Go Bowling in Norman, OK! Make your next event a piece of cake with our in-center catering! 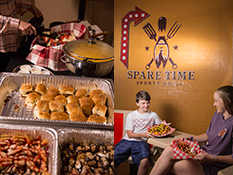 Whether you’re looking to feed a large group, fundraiser or company event our Spare Time Grill has everything you’ll need. Adding food and drinks to any group outing is easy. 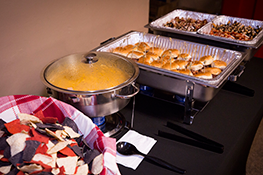 Choose from crowd pleasers like pulled pork sliders, fajita bar, our hot cocoa cart and cookie making station and many more fun ways to feed your group. 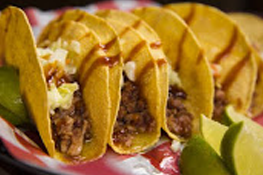 Please contact us about including our delicious group favorites into your next outing. Our newly updated Arcade and Game Room is family fun for everyone! Purchase any denomination re-chargeable game cards from our kiosk and let the fun begin! We have over 20 video & redemption games including 2 pool tables in a nice, clean easy to manage area by our Spare Time Grill. 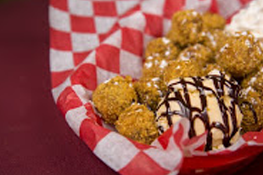 Order food and have some game time with your friends & family! Copyright 2019 © Sooner Bowling Center, Norman, OK's favorite bowling alley and family fun center. Whether you are serious about your fun or serious about your bowling, we are proud to be your town’s community bowling center! 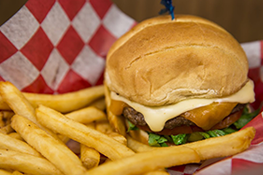 We feature 24 lanes of USBC certified bowling, a great grill and an updated arcade area for all your bowling fun. We love to share bowling and help you get together with family and friends.